In 2018, there were 81 races for Arabian horses in France run from mid-February until the end of November, 35 races for three-year-olds and 46 for older horses. The total prize money was €3,098,000. The leading horse was FAZZA AL KHALEDIAH (FR) with earnings of €500,000 to which were added €52,500 in breeders’ premiums, totaling €552,500. He finished in ninthposition in the overall table (including thoroughbreds). A great example of the advantages of breeding, owning and racing in France. Bred in France by Mohammad Al Nujaifi, AL SHAMOOS (FR) qualifies for the French premiums. She won the Gr 1 Qatar Trophy des Juments in Longchamp on 6th of October 2018, earning €75,000 in prize money, to which were added €32,508 in owners’ premiums and €11,551 in breeders’ premiums, totalling €119,059. There are over 300 Arabian horses in training in France, with numbers fluctuating throughout the year with the big stables from Qatar sending their horses over to race in France in the summer. They are divided almost equally between three-year-olds and older horses. Traditionally Arabian horses have been bred in the South-West of France but there are an increasing number of breeding operations in Normandy and in the West. Most of the races are held in the South-West with the more prestigious races being run in Paris and Deauville on the same prestigious cards as the Qatar Prix de l’Arc de Triomphe, Grand Prix de Saint-Cloud, Prix de Diane Longines and more. In 2018, 18 racecourses hosted Arabian races in France. Arabian racing in France, a worldwide reference. France features the most Arabian pattern races on its national racing programme, among them ten Group 1 PA, eight Group 2 PA and eight Group 3 races. A racing programme which attracts horses from Qatar, the USA, England, Holland, Belgium, Turkey, Morocco, Lybia etc. 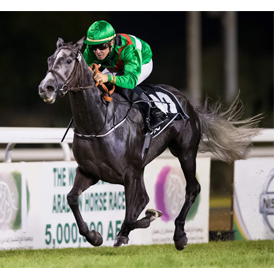 2015 was an outstanding year for French bred Arabians abroad, with eight Group 1 PA wins (the first Group 1 race of the UAE season was run in December 2014 : The National Day Cup).